I've been running this bolt on my build since it was direct gas impingement, I've since had the upper swapped to the caps carbine system, and this bolt, and also the BRA extractor, conversion itself, and the bolt have never missed a beat, feeding, firing, and extracting everything from surplus to hand loads with no hiccups, no cracks, no signs of corrosion, and nothing even resembling hurt feelings on the black rifle arms parts. Unreal precision, performance, accuracy and durability. This bolt is hard as a rock, smooth as fresh glass, and evenly and darkly covered in Melonite, what more could you ever want from a bolt? Oh, and the cases fit the perfectly machines bolt face wonderfully because the diameter is spot on, making the whole firing sequence seamless, cases fly out of this thing like birds from a shook tree, clearing the ejection port without a moment of hesitation. Never so much as a clink off the brass deflector. Q: Just curious if there would be any substantial gains upgrading to the Melonite bolt assembly over your previous model? Thanks. A: The bolts themselves, outside of being Melonited QPQ, are a higher level of machining itself and the extractor is outstanding. Besides the machining and extractor alone, the finish is far superb than phosphate. Melonite diffuses into the surface of the steel metal. The benefits of Melonite QPQ are: wear resistance, corrosion resistance, lubricity and/or decreased coefficient of friction and fatigue strength. Was this answer helpful? 18 of 19 Customer(s) found this Answer helpful. A: We state a "true" 7.62x39 bolt because we use the original specs of a .125" recess of the breach face of the bolt. Some in the industries think a 7.62x39 and a 6.5 Grendel have the same breach face which have lead to confusion and having some manufacturers headspacing barrels with a 6.5 Grendel breach face which is .135" which can lead to serious headspace issues. One would still need to use an enhanced firing pin with standard 7.62x39 bolts for steel case ammunition. Was this answer helpful? 9 of 9 Customer(s) found this Answer helpful. Q: Just saw you have a 7.62x39 bolt. Looks promising. Have you sold many? Have they held up to heavy use? Any extractor problems? How have you solve the problem of broken extractors that so many manufacturers are having? What is your warranty on the bolt? A: We've have sold thousands of bolts. I have had to replace one bolt, and a few extractors, but for the amount we have sold it's a very low percentage of failures. Warranty is 6 months. If one is breaking extractors on a regular basis then something else is going on with the rifle such as the bolt trying to strip a casing out before it has had time to shrink, so one would need to slow the bolt carrier down. Was this answer helpful? 6 of 6 Customer(s) found this Answer helpful. Q: Would like to know what material this bolt is made of, 9310, 158 etc? Was this answer helpful? 5 of 5 Customer(s) found this Answer helpful. Q: Will you guys be releasing a 5.56 melonite bolt assembly as well? A: Yes, we will be offering 5.56 melonited bolt assemblies to our product lineup in the near future. Q: Will this fit in any bolt carrier? And when will you guys have more in stock? 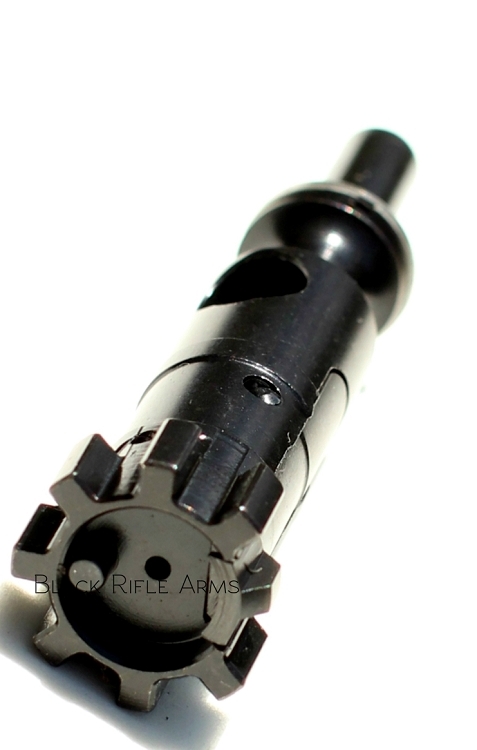 A: This bolt assembly will fit any AR-15 Mil-Spec Bolt Carrier. We should have more in stock this week. Q: How much does this bolt weigh? A: Bolt assembly weights 1.52 oz. Q: Are your bolts HPT/MPI tested? A: The supplier of our bolt assemblies uses a reputable metal company that does the HPT testing on their raw metals, and thus bolts are not marked as independent testing through manufacture is not done after machining. MPI testing is done in batches, while many mfg will engrave MPI on batch tested bolt assemblies we feel unless each bolt is tested it should not bear that marking. Copyright 2009- Black Rifle Arms. All Rights Reserved.